IndoCet Consortium - Facts: scope of work, structure, MoU, members, etc. The Indian Ocean Cetacean Consortium—IndoCet Consortium—was first conceived in November 2014, in Reunion island, France. It was a primary achievement of a regional workshop about humpback whale satellite tagging. See founding members. The IndoCet Consortium is dedicated to all cetacean species across the Southwest Indian Ocean (SWIO). Its geographic boundaries are 20°E and 90°E, and 12°N and 55°S. 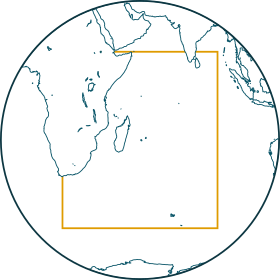 It reaches from the Northern limit of the Horn of Africa to the Southern limit of the Indian Ocean Sanctuary. Its western boundary is the southernmost tip of Africa. The primary goals and objectives of the Consortium are to advance understanding of cetacean biology in the SWIO, and promote their conservation. Helping research groups collaborate, advising SWIO range States for cetacean conservation and anthropogenic impact mitigation, providing training for biologists, conservationists and managers, developing citizen science, and promoting professional conduct codes and research ethics guidelines are some of the ways to achieve the Consortium’s goals. The Consortium comprises an Executive Committee and two types of members: active and associate. Active members are involved in cetacean research in the SWIO, whereas associate members are active in cetacean research outside the Consortium’s boundaries. See Consortium members. Learn more about the Consortium by reading or downloading the IndoCet Consortium’s Memorandum of Understanding. Find details about the context of the Consortium’s creation in the “Humpback Whale Satellite Tagging in the South- Western Indian Ocean” workshop report. This workshop took place in Reunion island from November 19 to 21, 2014.